Let me just state publicly that I am a carb lover to the core. While I eat them in moderation and generally try to eat whole grains, I adore bread, pasta, baked goods, and all of their carb-laden relatives. If it were wise, I would totally eat them for every meal. Rarely will you find me looking for a way to substitute for them or omit them entirely, and when a recipe requires a bunch of mental or I suppose, culinary gymnastics to achieve low-carb status, it will most assuredly receive a major side eye from me. However, I can definitely get on board with recipes that are naturally low carb and no worse off for it. I intermix those on our menu to keep things well balanced. This is one such recipe. 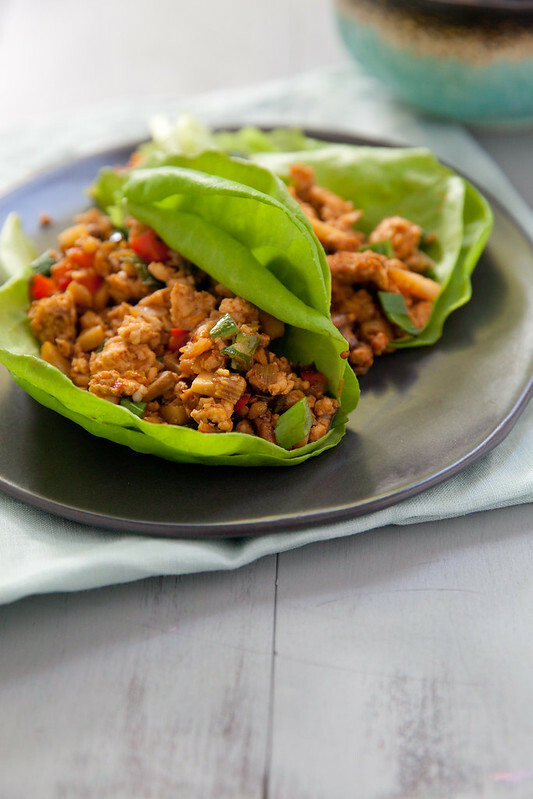 I have made lettuce wraps before and they have been fine, but nothing I liked enough to continue making on a regular basis. However, this version has me hooked. I have made these a few times since we first tried them and I can sense that they are on their way to becoming a frequent staple meal for us. 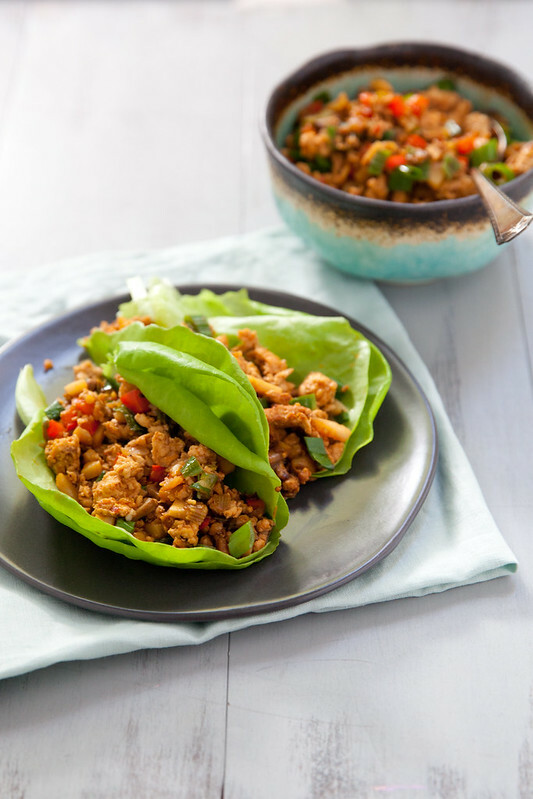 They are fresh, on the light side while still completely satisfying, and packed full of flavor. As written, they are on the spicy side and though the kids have eaten them this way every time, they do make some noise about it. You might consider dialing back the sriracha if you or your family is sensitive to spice. To make the sauce, combine all ingredients in a small bowl. Whisk to blend well. Set aside. In a large skillet, heat 1 tablespoon of the vegetable oil over medium-high heat. When shimmering, add the chicken and cook, breaking up the meat, until browned. Stir in 2 tablespoons of the sauce while it is cooking. Once cooked through, transfer the meat to a plate and set aside. Add the remaining 1 tablespoon of oil to the skillet, then add the scallion whites, garlic, and ginger. Cook for 1 minute. Add in the mushrooms and cook until they release their liquid, about 3-4 minutes. Return the chicken to the pan and stir in the water chestnuts, bell pepper, and the rest of the sauce. Cook until the liquid has reduced and thickened slightly, about 3-4 minutes. Stir in the scallion greens. Transfer the mixture to a serving bowl and serve with the lettuce leaves for wrapping.